It seems like Esther Arunga, was the one who helped Eric Omondi to realize his acting dreams. Eric would probably still be another unknown and struggling comedian, or perhaps in another career different from what he is doing. Esther Arunga has been having trouble in Australia for some time now. It started when her son died, which was reportedly a house accident. Cops however put the blame on Arunga’s husband Quincy Timberlake and arrested him and charged. Esther would soon be put behind prison a few days later in connection to the same. She’s currently out on bail and it will be interesting to watch how things develop. Eric feels he owes her life. Ok dear, can you make it to KTN, I and M building Thursday morning 11am to be exact and don’t be late!! She said sternly. Now I was literally shaking in disbelief…”Yes esther…I’ll be there”. ‘See you then’ She said and hang up. To cut the long story short I met Esther shortly on Thursday morning and since she was running late, she offered to buy me coffee the following morning at Java Yaya as I explained to her exactly how she could help. She did buy me coffee and introduced me to her entertainment outfit CINEMA (Christians in Media and Entertainment) they ran it together with Big Ted and Big Kev. She also came to Daystar to speak to the students, she brought along with her Nimrod Taabu the first time and Jeff Koinange the second time…This was huge, she made me believe in myself. I know you are asking yourselves, what’s the moral of this story. It was while I was performing at CINEMA at the former Galileo on museum hill that churchill officially saw my talent and Esther Arunga officially introduced me to the man who would take me and give me the biggest stage of my life, Churchill. God used her(Esther Arunga) to lead me to my destiny. I can confidently say I knew Esther Arunga, she was a friend and a mentor…A woman who loved God and cherished people around her…an encourager of talent and gifts a role model to the young (she won teeniz role model award that same year)…soft spoken, harmless, Joyful and cheerful. One thing happened followed by another and we soon lost hope and trust in Esther…but hope is never lost, we must hope against hope. 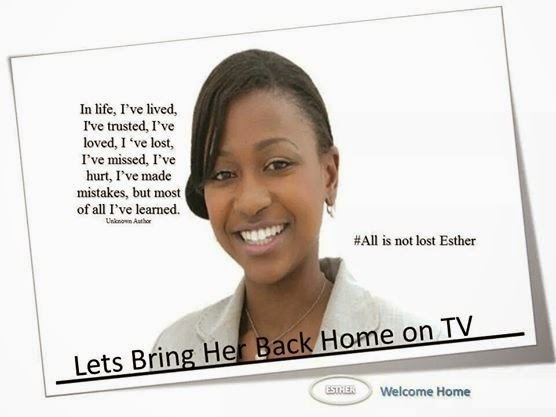 Let’s bring back our Esther, back to Kenya, back to her country, back to her family…even back to our Screens. I believe!!! We can!!! YES WE CAN!! !, bring back our girl.